The cell signaling group investigates cell signaling pathways and new regulatory mechanisms involved in autophagy, apoptosis and in a genetic disease affecting the nervous system: neurofibromatosis type 1 (NF1). Our scientific strategy is to develop research axes in two directions: fundamental research dedicated to the understanding of molecular mechanisms and applied research dedicated to the identification and development of new therapeutic targets and diagnostic tools. Our domains of expertise are cell culturing, molecular biology, quantitative PCR, protein-protein interaction studies and biochemistry. We collaborate with teams specialized in 3D modeling, organic chemistry and with clinicians. 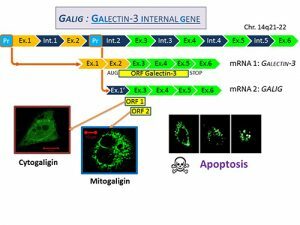 GALIG, a human gene embedded in the Galectin-3 gene has been initially described as a proapoptotic gene. It encodes two unrelated proteins, Mitogaligin and Cytogaligin. Proapoptotic properties have been established in relation with Mitogaligin which destabilizes mitochondrial membranes through specific interaction with cardiolipin, a mitochondrial phospholipid. GALIG is underexpressed in bone marrow of patients with Acute Myeloid Leukemia (AML). Mitogaligin and Cytogaligin have no homology with any other known proteins and their mechanism of action is still poorly understood. Recently, a partial Cytogaligin interactome has been established and reveals that GALIG could be associated with several additional biological functions related to the protein degradation pathways. Indeed, Cytogaligin interacts with several proteins related to autophagy and UPS (Ubiquitin-proteasome system). It interacts also with alpha-synuclein, a major protein in Parkinson’s disease. Our research focuses on the functional consequences of theses interactions in order to determine the potential role of Cytogaligin during autophagy and apoptosis. We also develop a translational project, in collaboration with several services from the Hospital of Orléans. The objective is to investigate GALIG gene expression and others genes in different pathologies and more specifically in acute myeloid leukemia (AML), Parkinson's disease (PD) and human immunodeficiency (HIV) infection. 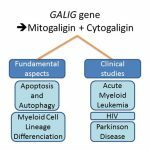 Preliminary data obtained from AML patients support the potential role of GALIG during differentiation of myeloid cells which is a critical point in the treatment and diagnosis of the disease. In addition, the level of GALIG expression returns to a normal one following chemotherapy treatments. Also, HIV patients exhibit an abnormal level of GALIG gene expression. These results encourage us to further investigate the role of GALIG in AML and HIV infection. Regarding Parkinson’s disease, preliminary data obtained from a small cohort of patients, revealed a clear disturbance of expression of several autophagy genes in peripheral blood. Further investigation are conducted to determine whether such deregulated genes may be considered as a molecular marker for prognostic and diagnostic. - Services d’Oncologie Médicale et Hématologie Clinique (Pôle Médecines interventionnelles), Drs Michèle SCHOENWALD et Diana CARP. - Unité d’Hématologie (Pôle Biopathologie), Dr Eric LEGAC. - Service des Maladies Infectieuses et Tropicales, Drs Laurent HOCQUELOUX et Thierry PRAZUCK. with an increased risk of malignancies, and neurological disorders. Currently, NF1 treatments remain poorly efficient, and identifying new therapeutic targets to treat this disease is a challenge for the forthcoming years. 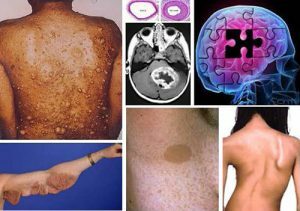 NF1 is due to mutations within the NF1 tumor suppressor gene, which encodes for neurofibromin, Nf1, a huge protein. We performed a two-hybrid screening and identified new partners of Nf1. We decided to focus on three of them, LINGO-1, LARP6, and LIMK2. We are also working on 5-HT6 receptor, which was identified as a new partner of Nf1 by a proteomic approach developed by the team of P.Marin (IGF, Montpellier). 5-HT6 receptor is a serotonin receptor which is a promising target for the treatment of cognitive deficits. Its constitutive activity on cAMP is regulated by Nf1. 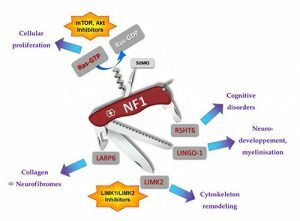 LINGO-1 plays a key role in different processes of the central nervous system (neuronal growth and survival, myelinisation), we are studying its functional interaction with Nf1. LARP6 regulates type I collagen mRNA translation, we showed that Nf1 disturbs the interaction between LARP6 and type I collagen mRNA. LIMK2 is a kinase involved in cytoskeleton remodeling, especially actin cytoskeleton via Rho/ROCK/LIMK2/cofilin pathway. We showed that Nf1 negatively regulates this pathway by preventing LIMK2 activation by ROCK. We are also working on the three human isoforms of LIMK2, and we showed that one of them is involved in mental deficiency. On another hand, we are part of a collaborative network with bioanalysts and chemists, to develop new inhibitors of LIM kinases (LIMK1 and LIMK2). Besides the connexion between NF1 and LIMK2, LIM kinases are misregulated in many cancers. They constitute new attractive therapeutic targets. In a previous similar collaborative project, we have developped new inhibitors of PI3K and mTOR, the most efficient molecules are currently under preclinical trial. Saurat T., Buron F., Rodriguès N., de Tauzia M.-L., Colliandre L., Bourg S., Bonnet P., Guillaumet G., Akssira M., Corlu A., Guillouzo C., Berthier P., Rio P., Jourdan ML., Bénédetti H. and Routier S. (2014) Design, Synthesis and Biological Activity of Pyridopyrimidine Scaffolds as Novel PI3K/ mTOR Dual Inhibitors. J. Med. Chem., 57, 613-631. Mollet L., Robinet P., Dubois M., Aurouet A., Normand T., Charpentier S., Sureau A., Grandclement C., Garnache-Ottou F., Deconinck E., Brulé F., Rohrlich P.-S. and Legrand A. (2013) Opposing Mcl-1, the GALIG proapoptotic gene is upregulated as neutrophils die and underexpressed in Acute Myeloid Leukemia cells. Molecular Immunology, 56, 123-128. Vallée B., Doudeau M., Godin F., Gombault A., Tchalikian A., de Tauzia M.-L., and Bénédetti H. (2012) Nf1 RasGAP Inhibition of LIMK2 Mediates a New Cross- Talk between Ras and Rho Pathways. PLOS One, 7, e47283. 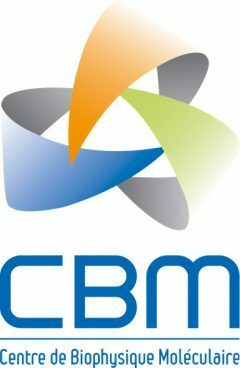 Godin F., Villette S., Vallée B., Doudeau M., Morisset-Lopez S., Ardourel M., Hevor T., Pichon C. and Bénédetti H. (2012) A fraction of neurofibromin interacts with PML bodies in the nucleus of the CCF astrocytoma cell line. BBRC, 418, 689-694. Robinet P., Mollet L., Gonzalez P., Normand T., Charpentier S., Brulé F., Dubois M. and Legrand A. (2010) The mitogaligin protein is addressed to the nucleus via a non classical localization signal. Biochem. Biophys. Res. Commun., 392, 53-57. Gonzalez P., Duneau M., Charpentier S., Normand T., Mollet L., Dubois M., and Legrand A. (2007) Destabilization of membranes containing cardiolipin or its precursors by peptides derived from mitogaligin, a cell death protein. Biochemistry, 46, 7374-7382.